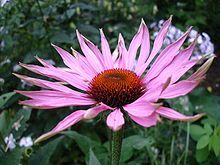 One of the best perennial flowers for late summer and early autumn is Echinacea Purpurea, a plant often referred to as the purple coneflower. This plant is a native of N. America growing from Virginia to Ohio, Michigan, south to Georgia and Louisiana. It is found growing in open fields, dry open woods and prairies. A member of the compositae or daisy family, it is well known to gardeners and wildflower enthusiasts around the world. Cultivation is easy. Echinacea prefers light, loamy, well-drained soil and a sunny position, but it will tolerate dappled shade. This is a very ornamental plant; it attracts butterflies and useful insects into the garden such as bees and hover flies. The long lasting flowers with their slightly backward pointing flower petals when fully open, bloom from July through to end of September are good subjects for the flower border. The daisy-like flowers with large, rich purple, white, or pink rays surrounding a high brownish-orange cone bring a touch of summer to the borders. These reliable perennials return each year. Some of them are white.